I am more than a little bit in awe of Australian author, editor, pulp paperback expert, and pop culture scholar Andrew Nette. He not only wrote one of best novels I’ve read this year: GUNSHINE STATE, a gritty, noir-flavored heist and revenge crime thriller set in Australia and Thailand. He also co-wrote and co-edited the recently-published book about vintage “youthsploitation” paperbacks: GIRL GANGS, BIKER BOYS, AND REAL COOL CATS: PULP FICTION AND YOUTH CULTURE, 1950 TO 1980, published by PM Press — one of the best-researched, most interesting, most lushly-illustrated books I’ve ever read. 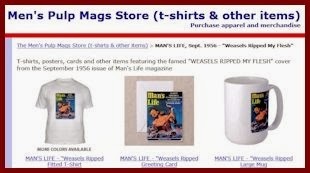 I also love Nette’s wide-ranging, interesting and insightful PulpCurry.com blog, which covers various types of pulp-related books, magazines and topics. As if that’s not impressive enough, Nette was a professional journalist in Cambodia and other Asian counties for nearly seven years in Asia. He co-founded the Melbourne, Australia-based indie publishing house of Crime Factory Publications, and edited story anthologies for that imprint. His book reviews and short fiction stories have in dozens of print and on-line publications around the world. His upcoming book projects include a sequel to GUNSHINE STATE, and a second anthology along the lines of GIRL GANGS to be published by PM Press in late 2018: STICKING IT TO THE MAN: REVOLUTION AND COUNTERCULTURE IN PULP AND POPULAR FICTION, 1956 TO 1980. He has also written a monograph about the classic 1975 science fiction movie ROLLERBALL, which will soon be published by Auteur. So, that makes three new Andrew Nette projects I look forward to reading later this year. And, I haven’t yet read his first novel, GHOST MONEY, but it’s next up on my Kindle. That one is a highly-praised crime story set in Cambodia. In his “spare time,” Nette is in the process of getting a PhD degree at Macquarie University, one of the top universities in Australia. His thesis is on the history of pulp paperback publishing in Australia. I first saw mentions of Andrew’s GIRL GANGS book, in Facebook posts by two other vintage pulp mavens I highly respect: novelist, editor and blogger Paul Bishop and vintage paperback fanzine publisher Justin Marriott. After I bought GIRL GANGS and started reading it, I was immediately struck by several things. One is that Andrew and his co-author and co-editor Iain McIntyre have an incredibly broad knowledge of vintage crime, “sleaze” and exploitation paperbacks published not only in the US, but also in the UK and Australia. They also expanded beyond their own knowledge by including reviews, analyses and interviews with authors provided by more than 20 other contributors. The second thing I noted is that Andrew and Iain use the modern, more inclusive definition of “pulp” that goes beyond the early pulp magazines. 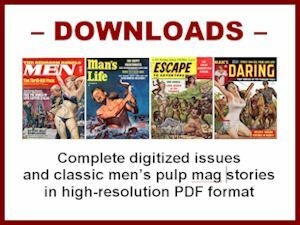 Although it annoys some fans of early pulp magazines, the term “pulp” has evolved. Just as “noir” has come to be an adjective applied to more than the black-and-white films made in the ‘30s and ‘40s, “pulp” has evolved into a useful and appropriate adjective for that goes beyond the digest-size magazines printed on rough wood pulp paper in the ‘30s and ‘40s. I also noticed that Andrew and Iain approach the vintage novels featured in GIRL GANGS the way I approach vintage men’s adventure magazines in this blog and in the books in the Men’s Adventure Library series I co-edit with Wyatt Doyle, the multi-talented founder of the New Texture indie book and CD publishing imprint. Like Wyatt and me, Andrew and Iain have a fan’s appreciation of how cool the stories and artwork are in the pulpy “artifacts” they feature. But they also delve beyond that surface appeal and discuss their historical and cultural context. In addition, they provide information about the publishers and authors, some of whom — like Harlan Ellison and Evan Hunter — went on to significant fame. 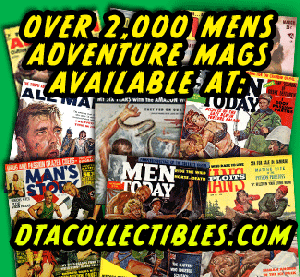 I plan to write several about GIRL GANGS, BIKER BOYS, AND REAL COOL CATS in future posts to discuss the many interesting similarities and connections between the novels it features and stories in men’s adventure magazines published during the ‘50s, ‘60s and ‘70s. I’ll start with a few connections that caught my attention in the first section of GIRL GANGS, titled — “Pulp Fiction’s Juvenile Delinquents: TEENAGE JUNGLE” — which focuses on subgenre of ‘50s novels that feature “JDs” and teenage gangs. 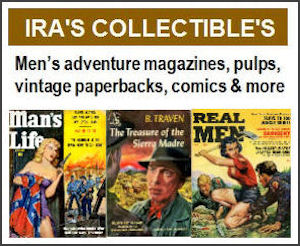 Many of the authors of the novels featured throughout GIRL GANGS had stories and “book bonus” versions of their novels published in men’s adventure magazines in the 1950s. And, many of the cover paintings on the hundreds of books shown in GIRL GANGS (in glorious full color) were done by artists who also did cover and interior artwork for MAMs. The cover art on that 1957 edition was done by the great men’s adventure magazine and paperback cover artist Samson Pollen. Sam’s original MAM artwork is featured in our book POLLEN’S WOMEN: THE ART OF SAMSON POLLEN. I also realized that the female and male models Sam used for the TEEN-AGE VICE cover painting are among the models he used for the very first illustration he did that was published in a men’s adventure magazine and for one or more of his early paperback covers. We included a photo of Sam’s first MAM illustration in a sidebar in POLLEN’S WOMEN, along with the fascinating story Sam told us about it. The painting shows four male juvies leering threateningly at a buxom blonde girl in an alley. Sam explained that to find models who really looked like juvenile delinquents, he went to a poolroom in Brooklyn where he knew some tough teenagers hung out and persuaded several of them pose for photos. He created a painting from those photos and used it as a sample to show Mel Blum, Art Director for the Atlas/Diamond men’s adventure magazines published by Martin Goodman’s Magazine Management company (ACTION FOR MEN, FOR MEN ONLY, KEN FOR MEN, MALE, MEN, STAG, etc.). Blum loved it and bought it on the spot. Thus, it was that painting that launched Sam Pollen’s long, productive relationship with Magazine Management, resulting in hundreds of great illustrations like those featured in POLLEN’S WOMEN. Blum used the illustration on the cover of the book about teen gangs ALLEY KIDS, published in 1956 by Lion Books, the paperback subsidiary of Magazine Management. ALLEY KIDS is a reprint of the HELL’S KITCHEN, originally published by Lion in 1952. The author, Benjamin Appel, also wrote another notable book about juvenile delinquents and the social conditions that helped produce them titled TEEN-AGE MOBSTER, published in 1955 by Avon. When a condensed version of Appel’s ALLEY KIDS was used in the June 1956 issue of KEN FOR MEN, Mel Blum used a badly-cropped version of Sam’s poolroom teens painting as the illustration for it. As Sam explains in POLLEN’S WOMEN, a surprising thing happened after that issue hit newsstands. Sam also did a classic cover painting for another book mentioned in the “Teenage Jungle” section of GIRL GANGS, BIKER BOYS, AND REAL COOL CATS, Bud Clifton’s D FOR DELINQUENT, published by Ace in 1958. Pollen’s cover painting for that one was reused two years later on the cover of the UK edition of THE BIG RUMBLE by Edward De Roo. In 1997, the painting was reused again on the cover of TEENAGE CONFIDENTIAL: AN ILLUSTRATED HISTORY OF THE AMERICAN TEEN PAPERBACK (an excellent book edited by Michael Barson and Steven Heller). Another juvie cover painting by Samson Pollen appears on the cover of HATE ALLEY (“Days and Nights of a Juvenile Delinquent”), written by Martin L. Weiss and published by Ace in 1957. Sam recently sent me some of the reference photos he took for his magazine and paperback cover art. I recognized the young lad in one of them as the kid with the hat in the HATE ALLEY cover painting. Another guy in Sam’s photos looks like the guy in the car on that cover. And I think both are in Sam’s “Alley Kids” illustration that Mel Blum used. I’m showing those reference photos here for the first time anywhere. 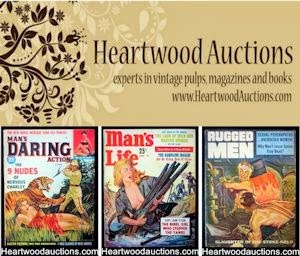 In future posts, I’ll discuss some of the other connections between men’s adventure magazines and the “youthsploitation” novels featured in GIRL GANGS, BIKER BOYS, AND REAL COOL CATS. In the meantime, do yourself a favor and buy a copy of that book. It’s available on Amazon worldwide in paperback and Kindle format. So are Andrew Nette’s novels GUNSHINE STATE and GHOST MONEY. Also, check out Andrew’s PulpCurry.com site, where I was immensely pleased to see a recent post about POLLEN’S WOMEN. Thanks, Andrew! You are a veritable gentleman and scholar — and a very cool cat.